Lidget Compton came up with the Deluxe Pent model after a decision was made to offer the very best complete concrete garage package. Styled on the Pent concrete garages range they have added as standard – PVCu maintenance free fascias, vergeboards, gutters and downpipes, as well as a PVCu window. The Up&Over door is upgraded to the delightful Georgian model and they have even added a 3ft wide vertical ribbed door which completes these concrete garages for most people. The Up&Over door can be optionally electrically operated if required. These concrete garages have fully galvanised one piece roofs complete with an anti-condensation barrier for very best performance. The sheer solidness of the concrete panels means you will have no worries about your car not being secure, also, there is no worry about them rotting. 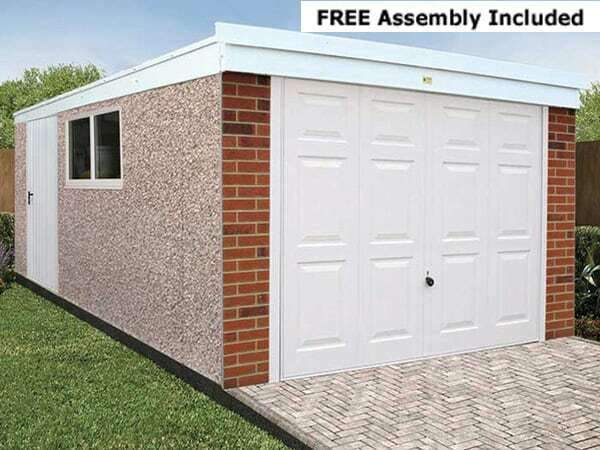 These concrete garages being sectional can be dismantled and taken with you if you move, a great benefit for you. A superb deluxe pent garage – how can you look elsewhere? Sizes: External Widths 8½ ft to 20½ ft Lengths 14ft 3in right up to 24ft 3in. Cladding: These deluxe pent. mono-pitch or single slope concrete garages are made from solid spar concrete panesl. There is an option for other claddings such as brick effect (in 4 colours), stone (Cotswold or Pennine) or in a textured finish. Construction: Vertical Panel Concrete System or Wall and Post finish. All provide reinforced interlocking panels for maximum strength, space and rigidity. Roof: One piece, fully galvanised, steep roof sheets which ensure no leaking. Complete with Grafo-Therm anti-condensation treatment. Mounted on C section galvanised steel rafters. White PVCu fascias and vergeboards included. Gutters: PVCu gutters and downpipes included as standard..
(up and over) Top quality Georgian Style Hormann ‘Up&Over’ with security enhanced 4 point locking (n/a on 10ft door). Option for vertical concrete garage doors, coloured doors, side hung timber garage doors as well as an electrically operated door. Hand pointed Real brick front piers posts. Personal Doors: White 3ft vertical ribbed personal door included as standard. Option for extra personal doors in timber, galvanised steel or PVCu. Also option for three point locking on steel doors. Opening in or out to suit. Windows: 4ft wide PVCu fixed garage window included as standard. Option for PVCu opening windows to suit your requirements. Guarantee: These deluxe pent concrete garages are complete with 10 Year Structural Guarantee which, unusually, is transferable if you move home. This helps to increase the value of your home. These superb Deluxe pent concrete garages are designed to be the very best and include as standard the following:- Georgian style ‘up and over’ door with security enhanced 4 point locking system (n.a on 10ft doors), white UPVC fascias and vergeboards, white UPVC 4ft wide fixed window, white 3ft vertical ribbed personal door, hand pointed Real Brick front posts in choice of colours, UPVC gutters at the rear as well as sand & cement fillet. If you would like these Deluxe concrete garages with different options then please ask.